This Cajun dish brings a bit of the South to your dinner table. Create an easy sauce with butter, fish broth, and spices before adding the crawfish for a delicious dish in no time. Serve this over white rice for a complete and filling meal with little effort. RecipeSavants.com This Cajun dish brings a bit of the South to your dinner table. 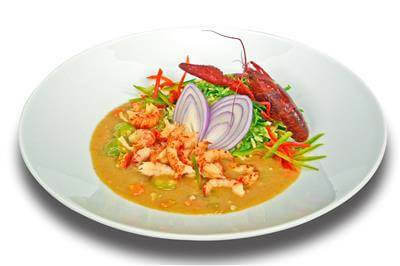 Create an easy sauce with butter, fish broth, and spices before adding the crawfish for a delicious dish in no time. Serve this over white rice for a complete and filling meal with little effort. Smart Recipes, American Recipes, Seafood Recipes, Recipes Seafood American Crawfish Etouffee PT57M Serves 4 Ingredients: 2 Cups Crawfish Meat 0.25 Cup Butter 1 Cup Tomatoes 3 Tablespoons All-Purpose Flour 1 Teaspoon Salt 0.5 Teaspoon Cayenne Pepper 0.25 Cup Parsley Chopped 0.5 Cup Celery Chopped 2 Cups Rice 0.5 Cup Scallions 1.5 Cups Onion 2 Cloves Garlic 0.5 Teaspoon Black Pepper 1 Teaspoon Tomato Paste 2 Cups Fish Broth Heat butter over low in a large saucepan. Remove from heat and then add flour and mix until smooth. Return to heat and cook (while stirring) for 10 minutes or until flour is a little brown in color. Add in scallions, garlic and celery and sauté for 10 minutes. Add fish broth and tomato paste and stir. Add in crayfish, parsley, tomatoes and seasoning and then simmer covered on low for 20 minutes. Serve topped over cooked white rice.